Scale model testing in waves is a well-established method for design verification of new or modified worldwide operating ships, as well as stationary offshore platforms. 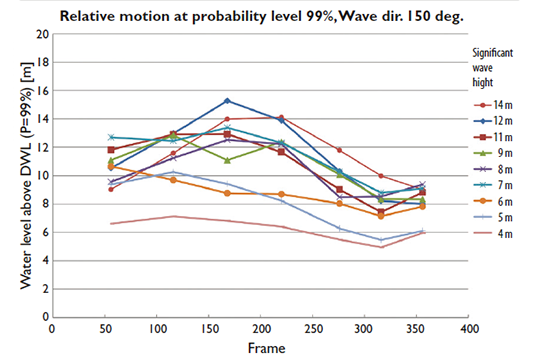 Furthermore, model testing in waves is often required by the classification societies in cases where it is necessary to demonstrate a behavior or effects that are impossible to predict theoretically. The challenge for a testing facility is to develop a model testing concept that adequately captures a situation and tests a design in a cost-efficient way. However, capturing the random behavior of ships in ocean waves is a particularly difficult task. SSPA was commissioned by Meyer Werft GmbH to investigate a new concept of overhanging lifeboats on a cruise ship. Compared to the traditional way of attaching lifeboats, this new concept could increase the risk of higher loads on the lifeboats in severe sea conditions. For this reason, the classification society, DnV, required model tests to be carried out in order to determine the dimensioning forces acting on the davit devices. For this project, the challenge was to develop a test program that could serve as the basis for predicting the most probable maximum forces acting on the lifeboats during the ship’s expected lifetime (30 years), at a statistically safe level of confidence and with a minimum number of tests. Having done this, the next step was to mount the lifeboats at these positions, run tests for the most critical sea states and wave directions and measure the forces acting on the lifeboats. Selecting the appropriate wave characteristics is crucial when deciding on a concept for model tests. Since ocean waves are random by nature, such a selection needs to be based on statistical methods. Measured and observed wave data from all over the world has been collected for decades. This data has been compiled into useful scatter diagrams. 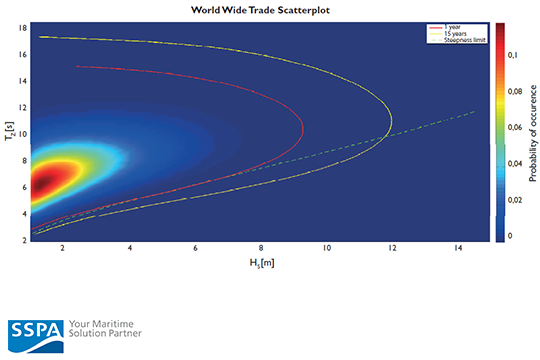 Figure 1 is a scatter diagram for ships in worldwide trade showing the distribution of all possible combinations of wave periods and wave heights. The red, solid line shows the one-year contour, i.e. 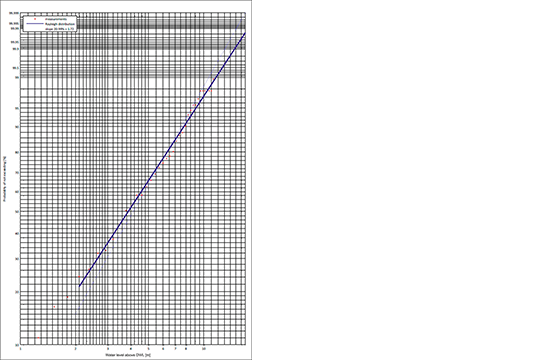 the most probable extreme values that will occur during a single year. However when it comes to water impact on overhanging lifeboats, the steepest waves are the most critical ones. Thus, combinations of average wave period and significant wave height along the steepness limit line (dashed) were chosen for the current tests. The tests were carried out in the Maritime Dynamics Laboratory with a free model, self-propelled by means of two PODs which were autopilot-controlled (above). The height at which the waves hit the ship’s side was measured at several positions along the ship. In order to limit the number of tests, suitable probability distributions were fitted to the measured results. From these probability distributions, it was then possible to determine the probability of the water reaching the level of the lifeboats (Figure 3). The results were presented in diagrams as functions of the lifeboat position, sea state and wave direction at a certain level of statistical confidence (Figure 4). In order to predict dimensioning forces (i.e. 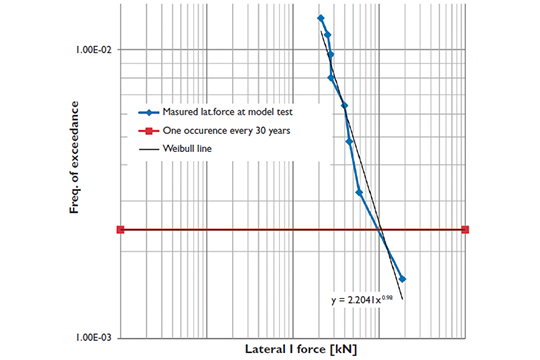 the forces that will have a sufficiently low probability of being exceeded during the ship’s lifetime), the most relevant test cases were selected for the force measurements. Because the range of possible sea conditions is so vast, it was important not only to consider the lifeboat positions and wave conditions, but also the realization of the sea state. A major challenge in conducting such tests is that the magnitude of the force caused by the water impact is a random variable and the most extreme behaviors occur infrequently. So, to obtain a statistically valid set of data, tests had to be repeated until the total measuring time corresponded to the probable time the ship would spend in the tested sea conditions during its lifetime. Having done that, a suitable probability distribution could then be fitted to the measured forces in order to determine the dimensioning forces with a high level of statistical confidence (Figure 5). Model testing can be used to study specific phenomena, like the wave induced forces on lifeboats in this example. However, the most common tests conducted in the SSPA wave basin aim at assessing the overall performance of a ship. The ship’s speed in various combinations of sea states and wave directions is then predicted, taking into account both involuntary and voluntary reductions in speed. The results can be used to rank different designs. It is then possible to calculate average speed or fuel consumption for the total time that the ship will spend at sea. Usually, the types of waves selected for these kinds of investigations are based on statistics from the North Atlantic. Because these standardized sea states are frequently used in model testing, it is easy to compare a new design to previously tested hull forms. Lately, SSPA has tested models for a number of major yacht projects. Yacht testing requires attention to details not only in terms of the methods and model accuracy, but also, and possibly most importantly, in terms of how to handle the demands and criteria set by the client.